The Society pin was designed in 1971 by Stuart Lane one of the founding members of the Society. This pin, also referred to as a lapel pin or a lapel badge, is uni-sided and its design is based on the three crown emblem of Ireland on a long cross similar to that used on the 15th century three crown coinage of Ireland. Obverse: Triple crown motif on a cross bottony extending to a beaded border. Within a beaded circle the legend SOC: NVM: hIBERNIE:, mounted on a spear pin. Sterling silver, 15.5mm dia. This pin is available for purchase at the Online Shop. The Society Silver medal is awarded to the winning entry for each of our annual competitions. One competition is the Visual Display Award and is awarded to the best entry in the January competition as judged by the members attending on the evening. The second competition is the Written Award for the best numismatic paper submitted by a member. 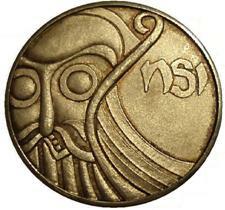 Obverse: Viking face and longboat prow, left, extending to border, NSI in right field. Frosted detail, mirror fields. Reverse: In a border legend a Celtic art triangular fret pattern above, The Numismatic Society of Ireland below. Blank for inscribing, maker’s mark IES, hallmarked .928. A bronze version of the medal is occasionally awarded at the discretion of the committee. To mark the occasion of the Society’s golden jubilee the committee produced a limited edition commemorative medal. The medal was struck as a tribute to the founder members of the Society and to all members of the Society in recognition of what they have done over the decades to keep the ideals of the founding members alive. The medal is struck in hallmarked sterling silver, 38.5mm dia. and weighs one ounce. It is also available with a gilt finish. No gold or bronze medals were struck. 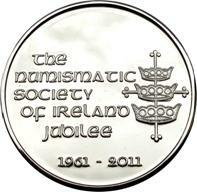 Obverse: In the right field the three crown badge of the Society, The Numismatic Society of Ireland Jubilee in the left field, 1961-2011 in the exergue, on a polished field, frosted detail. Reverse: Wreath on a polished field. The number of medals struck was strictly controlled by the Society and the final number was 95. The medals were struck by Lee Brothers in Dublin and have been skillfully crafted to the highest standards. The medals were available to members at cost.